Lightly oil the same pan and heat on medium-high. Add the tofu or chicken and cook in batches until golden brown (6-10 minutes). Turn out onto a plate covered in paper towel to remove excess fat. Set aside. Prepare dipping sauce by combining lime juice, peanut butter, fish sauce, sesame seeds and a tablespoon or two of warm water. Then add more warm water little by little until you like the consistency. I find the best way to make rice-paper rolls is to let everyone create their own. Place dipping sauce, vegetables, herbs and cooked tofu or chicken on a large serving platter in the middle of the table. You’ll need a large heatproof dish. Place this on the table and out of reach of young children. Pour in recently boiled water and soak rice papers one by one for less than 1 minute. Carefully remove from water and place flat on a plate. Put your choice of fillings in the middle then fold the ends in, and roll up like a tube. Don’t forget the fresh herbs! NB: If you are following the GDM diet 4 rice papers will be your limit. 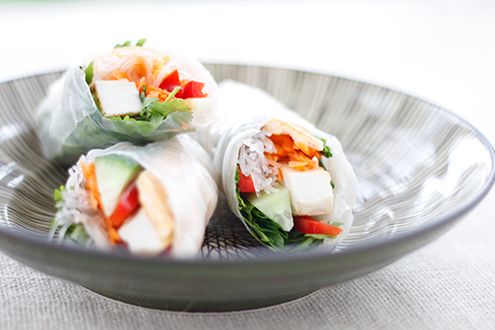 Use large salad leaves in place of rice papers for extra rolls. Post GDM suggestion: Replace tofu or chicken with or add cooked prawns to the mix. Add some crushed peanuts to your dipping sauce. And bean sprouts are always a delicious addition however they’re not recommended during pregnancy due to risk of listeria bacteria.